For many men, a hair transplant represents the ultimate way in which to achieve a full head of hair if they are balding, or their hair is thinning. And it certainly is a great process which gives those who have it confidence and a better level of self-esteem. However, for some men a hair transplant is not possible. Some of those men will have a measurement of 6-7 on the Norwood Scale. The Norwood Scale is the way in which hair loss is measured. Each stage is given a number, and the higher the number, the more evident the hair loss is. A stage 6-7 on the Norwood Scale is the highest level of hair loss, and this can mean that those who have it might not be able to have a hair transplant. When you have a hair transplant procedure, hair from a donor section of the scalp is transplanted onto the area of baldness that the patient wants to be covered. This necessarily means that there needs to be hair for use in this process. With a stage 6-7, there if often not enough hair, if any. And therefore a hair transplant cannot be carried out. That’s not to say that a hair transplant with this level of hair loss is always impossible – it entirely depends on the patient, the practitioner, and the potential donor area. And, for some with this level of hair loss, the outcome is favourable. 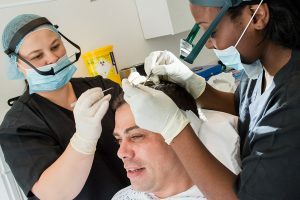 If a hair transplant is not possible, however, then there are alternatives, and the outcome can look just as good as those you would get with a hair transplant. It could even be a better result. Unlike with a hair transplant, no donor hair is required for scalp micropigmentation. SMP is the process of using pigment that is implanted into the scalp to give the impression of a shaved head (rather than a bald one). It can – when done well – look completely natural and no one would know that any kind of procedure had been undertaken. ← How Many Hair Grafts Should You Expect During A hair Transplant?